The Söll GlideLoc® system includes fall protection ladders, guide rails, and guided type fall arrestors. Söll GlideLoc® is a permanent fall protection system comprised of steel or aluminium notched rails for retro-fitting onto existing ladders, or fitting to any suitable installation via a variety of brackets. The unique glider travels smoothly up and down the rails centre stile with minimal effort. In the event of a fall, a spring loaded cam activates and locks into the notches in the rail, arresting the users fall within centimetres. Rails and ladders are available in a variety of materials, and a wide range of components allowing the system to be engineered to suit a variety of applications. Easy to use, the system offers a safe working environment. It is the only system where the user can lean forward or backwards whilst ascending and descending and allows hands free operation for greater productivity and less fatigue. Comfort fall arrestor provides connection between the full body harness worn by the worker, and the guide rail. Ensures complete safety during any ascent or descent. 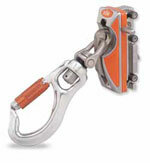 The stainless steel clamp locks onto the rail in the event of a fall. Unique deformable structure absorbs most of the impact energy of a falling person, thus reducing fall arrest forces to an extraordinary level of only 3.7kN. UNIVERSAL II can be inserted or removed at any point on guiderail. 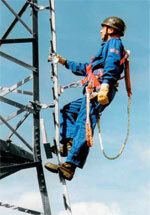 Fall protection ladders feature an integrated guide rail fall arrest system in the centre stile. 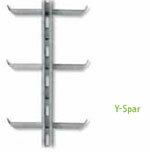 Y-spar is a cost effective alternative. The low surface area keeps wind loads transmitted onto the understructure to a minimum. Twin ladders - The operator can glide their hands along the side rails when ascending without having to hold onto the rungs. 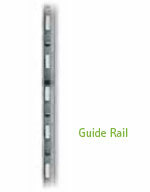 Guide Rail can be assembled onto pre-installed ladders and step irons, and can be mounted in the middle or side of an existing ladder. An innovative alternative to the ladder cover plate, the PivotLoc is a foldable ladder section for restricted access. Can be closed when not in use, preventing unwanted access. Can be locked open to prevent accidental closure. > Can be used in conjunction with other ladder systems. A discrete profile only 105mm wide in the closed position. The wind resistance of the system is at a minimum when closed. Side rails offer additional support to the climber. The twisted change over rail provides positive connection from ground to platform without disconnecting. 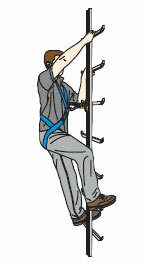 Allows the climber to move safely onto a platform. Provides continuous connection for the user. Can be used in conjunction with the vertical guide rail system. Easy transition from vertical to horizontal. No need for user to disconnect at the top of the ladder. Provides the safe change of travel direction from horizontal to vertical travel. Change of directional travel from left or right. It "parks" the comfort fall arrestor whilst direction is changed. Can be installed on any type of SGlideLoc system. A flexible alternative to standard vertical ladder work. 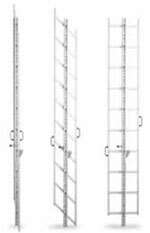 Ladder accessories provide workers with infinite options to suit their specific working situation. Folding foot rests provide a rest platform that folds away. The turntable allows climber to transfer to a horizontal track. Exit section allows climber to release the shuttle from the rail. 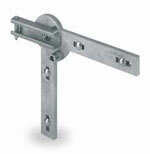 Ladder connectors and brackets suit a variety of different installations and structures. Top and bottom end stops assist in correct insertion of the glider. They prevent the glider from accidentally slipping out of the rail. 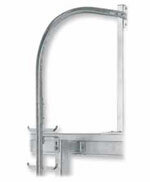 Many bracket options are available to fit ladders to structures from rung clamps to weld on and bolt on brackets.